In honor of the acquisition of the @ sign by MOMA comes this fabulous shawl pin! 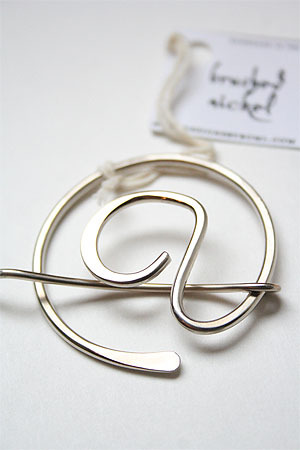 Simple, yet sophisticated, this pin blends a sense of whimsy with its elegant design. This light and simple pin's design is modeled after the classic penannular; the stick portion is attached to the pin and slides around to lock. Measurements are approximately 2 inches x 1.75 inches. All pins are hand made and will vary slightly in appearance.